Perhaps the most profound irony in life lies in the way people affect each other’s lives, often without even knowing it, all while making it a point to keep those very people at a safe distance. We live behind walls – some self-erected, others put up for us – built from fear of the unknown, unwarranted judgments, and anything that we perceive to be a threat to our safety and happiness. Perfect strangers will sooner cast judgments on one another from afar, based on something as inconsequential as skin color or style of clothing, than they will hold open a door or share a cab ride. We rarely stop to consider the source, be it internal or external, of the wariness we hold for our fellow man. Once in a while, a chain of events will be set in motion that removes the distance we keep, and forces us to connect, for better or worse. The award-winning film Crash, directed beautifully by Paul Haggis, examines the chaotic and revealing intersections of a group of individuals in Los Angeles, most of whom are both victims AND perpetrators of racial prejudice. The characters in the movie, all of different skin colors, nationalities, and economic classes, meet each other in passing, or sometimes in prolonged and violent conflicts, and are left to come to grips with their own prejudices, even as the same hatred is focused on them. So rarely comes along a film that pulls the viewer’s emotions in so many opposing directions as does Crash. Each moment is beautiful in its ugliness, or in its violence, due in large part to the writing, which is raw and real to the core, as well as the brilliant performances turned in by the actors. Of the many, one performance of note is that of Matt Dillon, who plays a hardened, racist officer with the L.A.P.D., whose professional demeanor is horrifying, but shows the utmost humanity while caring for his ailing father, making the viewer remember that deep beneath his questionable actions and defenses, there is some semblance of a good man. Dillon’s character, John Ryan, turns a corner by saving the life of an affluent black woman (played ferociously by the talented Thandie Newton) who he humiliated sexually during a traffic stop earlier in the film. Her character, Christine, spends the majority of the movie at odds with her TV director husband Cameron, portrayed by Terrence Howard, over his relatively passive acceptance of the racial injustice to which they both fall victim despite their social status. The fire that rages beneath Cameron’s stoic exterior fills his eyes with tears when he’s approached by his white co-director (the seemingly well-meaning Tony Danza) and told that one of the characters on their show doesn’t sound “black enough” while reciting his lines. That same fire later explodes in a violent climax during a run-in with police and two would-be hijackers, Anthony and Peter, played by Ludacris and Larenz Tate. During that scene on the street, Anthony says to Peter, in a quite exasperated manner, “But this white woman sees two black guys, who look like UCLA students, strolling down the sidewalk, and her reaction is blind fear?” This is one of the more self-aware moments in the movie, with Anthony not only knowing that he is a criminal, but also knowing what he is about to do, and yet is still incensed by Jean’s reaction when she moves closer to her husband as they walk by. Her morally misguided instinct was sadly vindicated just moments later during the carjacking. While the film deals with racism in very direct and brash ways, it also conveys messages with more subtle, thought-provoking methods. 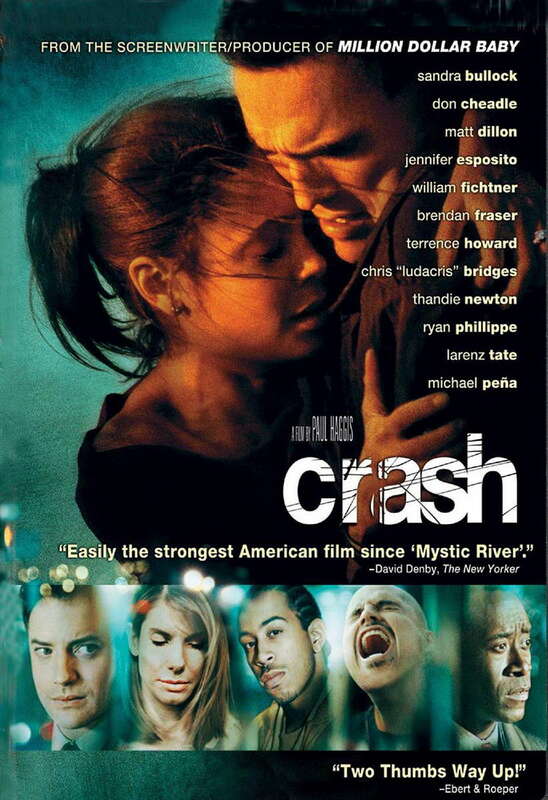 Crash employs symbolism through much of its runtime, in contrast to the volatile interactions between the characters, to further explore the depth of human nature. For example, L.A.P.D. officer Tom Hansen, played with idealistic sincerity by Ryan Philippe, and petty criminal Peter Waters, both carry statues of St. Christopher, known as the Patron Saint of Travel. These two characters meet at one point towards the end of the film, and both prove to be quite unlucky in their travels despite their belief in the statue and the protective power for which it stands. Also, when Daniel’s young daughter hears gunshots outside in their neighborhood, he bestows upon her an invisible cloak, which she later uses to “save” his life during a run-in with the angry Iranian shop owner who blames him for his store being broken into and vandalized. Another poignant scene near the end of the movie features several of the characters looking through windows, in a sort of montage, arguably representing a newfound clarity that each of them has obtained, having learned lessons about the injustices they have not only suffered, but also foisted upon others. Volumes are also spoken throughout the film by the use of music and lighting, two essential aspects of filmmaking that bring additional life to scenes that can only prove so much with even the most stellar acting. The film’s score, provided by Mark Isham, foreshadows many events throughout. Often looming and ominous in tone, the music gives the viewer the uneasy feeling that something unfortunate is about to happen. At other times, while still tense in a way, the soundtrack takes on a more cathartic, triumphant air, such as in the gripping scene in which Officer Ryan risks his own life to pull Christine out of her overturned truck, just seconds before it explodes. The lighting used is also so important that it is almost a character in the movie. Many of the scenes that are violent or dark in tone take place under the abundant, seemingly eternal sun that soaks the streets of Los Angeles. However, those same scenes, such as Cameron’s near-fatal rendezvous with the police; Ryan’s selfless, last-second attempt to save Christine; or the near-death experience Daniel and his daughter had at the hands of the enraged shop owner, end with an epiphany, or victory of sorts. The age-old theme of “light conquers dark” stands as a symbol in those instances. Conversely, several other important scenes that delve into negativity and loss take place at night, on the dimly lit back streets of the city such as the grim discovery that Detective Waters makes about his brother, the degrading traffic stop suffered by Cameron and Christine, or the carjacking that victimized the District Attorney and his wife. Crash is a remarkable tale of love, hatred, violence, and redemption. Detective Waters, played by Don Cheadle, opens the film by saying, in reference to the barriers we construct around us, “I think we miss that touch SO much, that we crash into each other just so we can feel something”, just after being involved in a car accident. This rather astute thought foreshadows the events that are to befall the movie’s many characters, and immediately drives home the film’s demand that the viewer perform an evaluation of their own mentality, hopefully finding a way to rid their minds of the baseless assumptions they make about others on a daily basis, and restore their faith in humanity. Paul Haggis presents the movie as a microcosm of the beauty and ugliness of human relations at large, and also as an inflated picture of the conflicted psyche of the individual, who may at times disregard the basic rule of humanity- “do unto others as you would have done unto you.” As many of the characters in the film wretch at the senseless prejudice flung upon them from all sides, they also quite willfully exact the same pain upon others. Haggis’ portrait of this unfortunately natural dichotomy of man forces the viewer to look inward, and relive those times that they dismissed another human being as unworthy, without a word, a touch, or so much as another fleeting thought. Well written! One of my favorite movies!